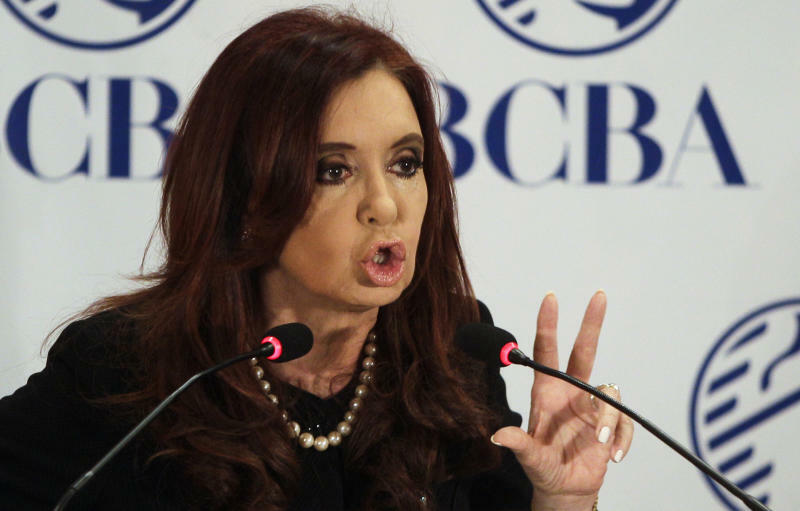 BUENOS AIRES, Argentina (AP) — Argentina proposed a creative way out of its debt showdown Friday night, describing a mix of cash and bonds that it suggested would amount to a huge profit, but not a gargantuan one, for the investors it calls "vulture funds." The government's lawyers gave an appellate panel in New York a proposed payment plan that could take many more years to cancel $1.44 billion in defaulted bonds, interest and penalties left unpaid since the country's world-record 2001 default. "Argentina's proposal accounts for past-due amounts to bring the debt current, provides for a fair return going forward, and also gives an upside in the form of annual payments if Argentina's economy grows," the Cleary, Gottlieb lawyers said. The money directly at stake in this case is just a fraction of Argentina's remaining defaulted debt, which adds up to more than $11 billion in capital and interest. This plan would also enable those creditors to get paid as well, over time, providing an equitable solution, the lawyers argued. And to be truly fair to all, they said the new bonds would also be made available to the vast majority of investors who accepted pennies on the dollar in 2005 and 2010 for their defaulted debt. Argentina is arguing that to do otherwise would violate the principle the court aims to uphold — the "pari passu" clause in the original bond contracts, which means the sovereign debt issuer must treat all bondholders equally. "This proposal would provide plaintiffs with significant compensation, and — unlike the '100 cents on the dollar immediately' formula adopted by the court below — is consistent with the pari passu clause, longstanding principles of equity, and the Republic's capacity to pay," Argentina argued. Just who owns these bonds and at what price they were originally bought for is impossible to say. Even defaulted bonds are constantly traded, and the plaintiffs include huge hedge fund investors like billionaire Paul Singer as well as Argentine retirees who saw their much more humble life savings melt away in Argentina's economic crisis. Under this deal, Argentina said the mom-and-pop investors would get immediate cash for the interest that has built up since 2003, plus Par bonds and GDP bonds that would eventually make them whole. It cited as an example nearly $50 million in defaulted debt that the lead plaintiffs, NML Capital Ltd., reportedly purchased in 2008. Accepting the mix of new bonds in exchange for these bad debts would eventually provide an aggregate profit of 284 percent, but not an unfair gain of 1,380 percent, the lawyers argued. President Cristina Fernandez personally reviewed the proposal just before it was filed, the state news agency Telam reported. Fernandez and her economic team are proud of sharply reducing the country's foreign debt burden from 166 percent of GDP in 2002 to just 46 percent recently, and never failing to meet payments on the new bonds her government issued in exchange for the defaulted debt. Argentina can pay $1.44 billion, but there are many more creditors seeking the same kind of judgment that NML Capital Ltd. won from U.S. District Judge Thomas Griesa last year. If upheld, it would force the country to pay out an economy-destroying $43 billion in cash, the government said. But the payment plan it proposed Friday night includes some bonds that wouldn't come fully due for 25 years, and that could be a non-starter with the appellate judges in New York, whose rulings in bond litigation are almost never second-guessed by the U.S. Supreme Court. If the court agrees to Argentina's payment proposal, Fernandez expects a willing congress to promptly enact it, and voluntary exchanges of defaulted debt for new bonds would then eliminate most of the remaining mess, whether or not Singer's hedge fund accepts the deal, the filing said. But if the judges don't agree and Argentina loses in court, it could be "suicide" for the South American nation's economy, says financial analyst Josh Rosner, managing director of Graham Fisher & Co. in New York. "The court was looking for something simple, like: we're not going to pay them in a lump sum, but we're going to make a quarterly payment of the full $1.4 billion over three years. They weren't looking for creative financing where Argentina demands or forces a new bond," Rosner said. "What if somebody took that new bond, and the Argentine government defaulted the next day?" Refusing to pay the holdouts anything better than what the exchange bondholders got is a politically popular position among Argentines, but Rosner says that's irrelevant when it comes to the markets. "Monday morning is going to be a disaster," Rosner predicted. Argentina's economy is being strangled by punishingly high borrowing costs because the Fernandez government hasn't fully settled its debts to bondholders, other governments and the many companies that have won judgments against it, Rosner said. Instead, the government borrows from its own people, fueling inflation, and tries to centrally manage the increasingly isolated economy by frequently changing the rules for exchanging currency, importing and exporting goods, setting prices and paying taxes. Increasingly, Argentines are feeling trapped by the government controls, and foreign companies are being scared off. "This economic starvation ends up, by necessity, with the ultimate cutting of those services — education, police, energy subsidies, transportation subsidies to the provinces, which is going to increase social unrest," Rosner said. "It's a human tragedy. I'm not understanding why they're fighting this."